Fun Fact: I wrote my thesis about Antarctic Literature. Yes, that’s a thing! My professor pushed the subject, because she was clearly taken by it, and her enthusiasm rubbed off on me. It’s very niche, but incredibly exciting and rewarding. Because there aren’t many fictional works that are set in Antarctica, you can get through the entire canon in a few weeks and call yourself “a bit of an expert” as soon as anybody mentions anything ice-related. 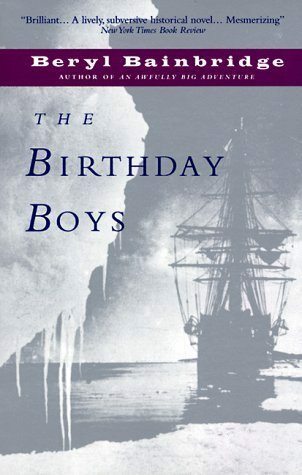 Beryl Bainbridge’s The Birthday Boys is the best-known fictional account of Robert F. Scott’s disastrous dash to the South Pole. It gives each of the five members of the expedition a voice by letting them chronicle a part of the journey in their own words (well, what Bainbridge imagined their own words to sound like, at least). It’s haunting, and revealing, and the ending, fictionalised or not, will never lose its terror. After reading, re-reading, and analyzing it, I was convinced that Beryl Bainbridge was one of the finest writers of the 20th century. Born in 1932, Bainbridge was from Liverpool, which endeared her to me before I even read any of her work. She was shortlisted for the Booker Prize five times, and although she never won, the Man Booker Best of Beryl award was created after her death in London in 2010. I was a latecomer to her work, but I vividly remember a documentary I watched in 2007. 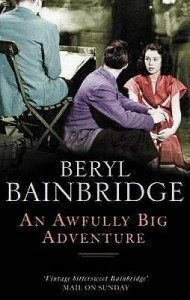 Beryl’s Last Year follows the writer over the course of what she is convinced will be her last months. Starting on her 71st birthday, and made by her grandson, the documentary reveals that both Beryl’s parents died at 71, and she has developed an obsession with this fact, although she discovers later that it’s not true. It’s an intimate portrait of a brilliant writer and chaotic person who refuses to stop smoking and gives the impression that she hasn’t fully come to terms with her past. A palpable sense of sadness pervades the film, and it’s this sadness that has drawn me to her novels. Harriet Said.., her first book, was written in 1958 but not published until 1972. 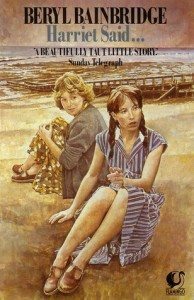 It’s set in a Northern English coastal resort and follows two young girls, Harriet and the unnamed narrator, over the course of a few days. The narrator develops a crush on an older man who lives nearby, and lets herself be persuaded by Harriet to interfere in his marriage. 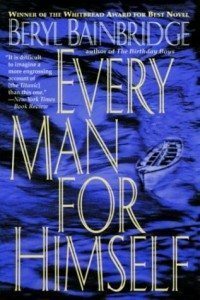 Things go horribly wrong in an unexpected and shocking way, but it’s not just the powerful writing that endeared the book to me — Bainbridge portrays those young girls so well and makes their actions so thoroughly believable that I still count it as one of the best and truest books I’ve ever come across. Not bad for a novel that was rejected by several publishers for the “repulsiveness” of its main characters! An Awfully Big Adventure, which was made into a film starring Alan Rickman and Hugh Grant in 1995, takes its setting from Bainbridge’s own youth and experiences at the Liverpool Playhouse. Stella, new to a theatre troupe rehearsing Peter Pan, becomes entangled in a web of dark secrets and intrigue. It’s been a while since I read the novel, and I don’t remember much of it, but the last sentence is as heartbreaking as anything. I must reread this soon. After The Birthday Boys, I was drawn to Bainbridge’s other historical fiction novels. 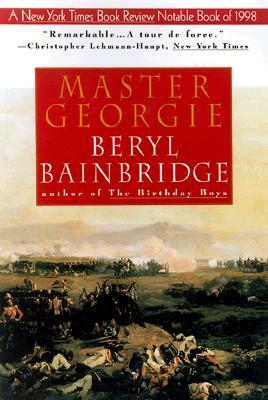 Master Georgie, set during the Crimean War, follows George Hardy, a well-off Liverpool surgeon who volunteers to go to Inkerman in the Crimea to fight. As in The Birthday Boys, the story is told by different supporting characters. I love this technique of Bainbridge’s; it adds so many layers to a story that would be interesting enough were it to be told in a more straightforward manner. In Master Georgie, the story becomes so much more, and yet, like life, it seems never fully told. Every Man For Himself follows the events of the sinking of the Titanic. Again, it’s not a straightforward story, and one that needs a little time to unfold. The reader follows Morgan, the adopted nephew of millionaire J.P. Morgan, who struggles with both his past and his future on his way back to his family in America. Surrounded by his peers, all young, rich and carefree, he is drawn to a mysterious trio of people he first sees while waiting to board the Titanic on her maiden voyage. Scurra, the most mysterious of them all, seems to know everyone on board and catches Morgan unaware by analysing his fears and illusions, heightening Morgan’s depression and unease. All the while, the Titanic steams towards disaster… The obvious genius of the novel is that everybody knows what will happen in the end, and every little detail gains significance, from snippets of conversations about bad omens to the way the people on the upper deck seem utterly bored with their lives, yet they will be the ones to survive. Bainbridge has a field day playing with the readers’ knowledge of events. 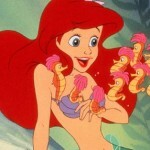 She weaves little facts into the fictional story, and everything seems completely believable. I can see how people looking for the big drama would be disappointed up until the last few pages, which managed to choke me quite a bit, but I loved the way Bainbridge stubbornly focussed on Morgan’s point of view. As in any good story, he does grow and learn, and it’s mostly thanks to the mysterious and not altogether likeable Scurra, who plays the role of a Mephistopheles. In conversation with him, Morgan discovers and begins to doubt his morals and convictions, and in the end sees his peers and (adopted) class for what it is — something that stubbornly clings to the splendour of the sinking ship and ultimately lacks the willpower to swim to safety. Every Man For Himself is a short novel, and a beautifully understated one. 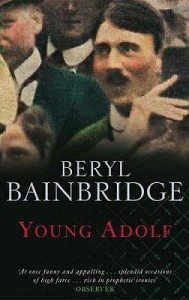 There are still plenty of Bainbridge novels left for me to read, including Young Adolf, in which a young Hitler gets into trouble in Liverpool. This year seems like a good time to get on with it. Why don’t you join me? Vampires in Antarctica? Or Bainbridge vampires? Vampires in Antarctica! A guy goes to the research station, goes scuba diving (for research? I dunno), finds a body encased in ice, vampire mayhem ensues. Oh dear god that is awesome! But… no. Maybe I’m really old and it was published after my thesis. I’ll read it now though! I would tell you the title/author, but I Goodwilled it :). I can tell you that it was shelved in the SFF section at Barnes and Noble and from the cover/blurb, I thought it was going to be a Michael Crichton-ish kinda book. Every Man For Himself sounds like the one for me. 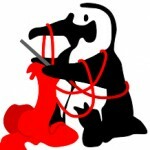 And Antarctic Lit Pro? Wow, Karo. Did you read the Vampire one? Cause that book was weird! Too stupid to hit “reply”… See my post above.